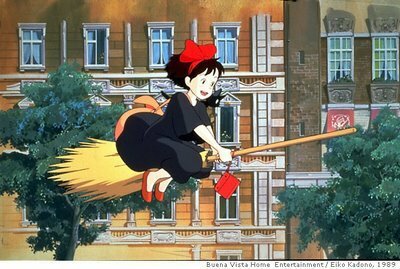 Kiki’s Delivery Service ] is another winner from a stable of Miyazaki gems that i shall never tire of watching. this coming-of-age film centers on Kiki, a young witch-in-training who sets out for a city/town of her choice and learn to live and manage her way around ‘normal’ people (sort of like a finishing school before young trainees can actually concentrate on the serious business of practicing their craft). 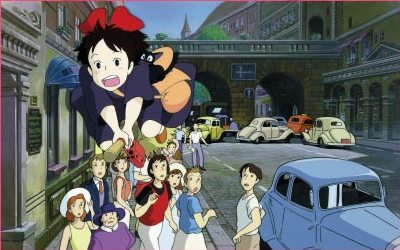 with her familiar (a spunky black cat named jiji) in tow, Kiki finally decides to live in a seaside city because she has never seen the sea before. after a shaky start, she finds lodging and part-time work with a kindly bakeshop-owning couple. meanwhile, she has her hands full as she tries to get her fledgling business off the ground: delivering packages/parcels by air — courtesy of her broom. at first, city folks are amazed to see a young witch at their midst, and would often watch in fascination as she goes off into of her delivery trips. eventually, they grow used to her presence. after a while, kiki’s business begins to thrive. she also manages to form bonds with several people: ursula, a young reclusive artist who lives in a remote village; tombo, a young boy of her age who is passionate about planes and flying; oku-sama, a rich and elderly customer. soon enough, however, kiki undergoes a crisis of confidence that shakes her to the core. at some point, her self-doubts begin to affect her ability to fly and this leads her to question her choices. 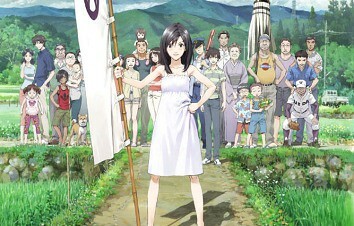 how she resolves this setback and finally regain her confidence is handled by Miyazaki et al. (Studio Ghibli) with delicacy and bittersweet detail — it’s the kind of stuff that inexplicably tightens your throat long after ending credits had rolled. 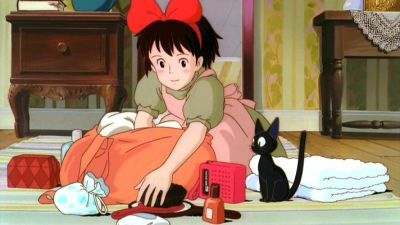 with Kiki’s Delivery Service, miyazaki once again validates his deft touch in dealing with issues that confront young people who are in the brink of adulthood. nothing really earth-shaking or emotionally shattering happens in this movie, but you can easily empathize with the characters. the european setting has a comfortable, nostalgic feel to it. for some reason, there is something captivating about seeing life’s wonders and terrors from the vantage point of a young girl who is desperately trying to hold on to her broom as a source of comfort, security, and ultimately, strength. The other day, while I was rearranging my CDs, I stumbled across an old anime favorite (Hayao Miyazaki’s My Neighbor Totoro) that got mixed up in the pile by mistake. Without further ado, I popped it in my player. As the familiar strains of the upbeat opening song wafted into my tiny living room, I was once again gently reminded why I (and thousands of other viewers) like his films so much. As nostalgic trips go, this film is note-perfect for its insidious charm that soothes you down like a comfortable pair of slippers. 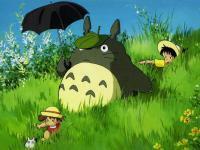 Among Miyazaki’s animated films, I’ve always found My Neighbor Totoro (Tonari no Totoro; 1988) the easiest to relate to because, notwithstanding its supernatural elements, the story is essentially grounded in reality (with subtle autobiographical brush strokes) and takes place in a sleepy rural setting. The movie has no overt violent scenes, which should make this animated feature fairly suitable even to young children, although it does deal with the threat of loss and pain as only a child can sense it. The film teems with childlike wonder, discovery and ready acceptance of extraordinary incidents. 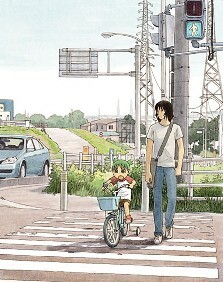 Basically, it’s one anime title that I’d be pleased to recommend to anyone regardless of his/her age. Without giving away the rest of the story (I really don’t want to spoil the experience for those who still haven’t seen it), there are several items in this film that should be fairly obvious to a Miyazaki enthusiast. The main protagonist is a young girl (or in the case, girls) who’s learning to grapple with the complexities of life (a recurring theme in many Studio Ghibli films such as Spirited Away, Kiki’s Delivery Service, Laputa Castle, Porco Rossi, etc.). 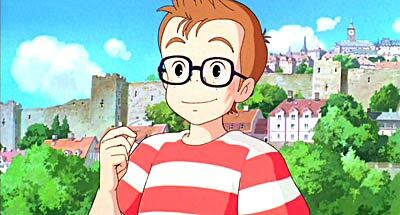 There’s also an endearingly clumsy young boy, Kanta, who shows an abiding interest in planes/aviation (Kiki’s Delivery Service, Laputa Castle), a trait that Miyazaki shared as a child. This movie likewise highlights, in unobtrusive but touching instances, the way the Japanese show respect for their old and the ‘natural’ spirits around them. 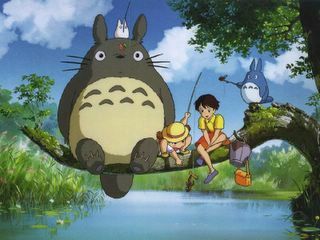 I don’t know how much of what is shown in My Neighbor Totoro actually reflects Miyazaki’s childhood, but I’ve read somewhere that he was quite close to his grandmother and that his mother had also suffered from a serious ailment (TB) which required a lengthy hospital treatment. 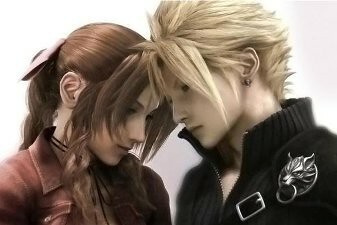 He’s known to care deeply for his female relations and I think it shows in the way he presents his female characters, even those who are initially perceived as the villainess of the piece.